More to the point, everyone I had the opportunity to interact with in Brazil were wonderful, generous, kind and immensely joyous people. I could not have had a better trip. And I learned so much. And I have so much more to learn. Before I get into some of the details of the trip I want to say I have read and responded to the near 600 emails that greeted me upon my arrival back to the states. If at this point you have not heard from me I accidentally overlooked your email and ask you to write me again. I’d be surprised if a handful didn’t slip through the cracks. I guess this is going to be a trip report, mostly because people keep asking for it. I’m not sure how interesting my travel log is, but here we go. After this I will be putting together a page about what I learned about fermentation along with some musings I have. Wake up 3 am and travel 6700 miles to Sao Paulo Brazil. Arrive in Sao Paulo at ~9 am with 3 hours sleep, finally making it to my hotel a couple hours later. Check in and proceed to walk the Higienopolis district for the next 5 hours to get my internal clock reset. Learn my first bit of Portugeuse (aside from ‘Eu nao falo portugues’). Agua sel gas is flat water, agua con gas is carbonated water. Sucessfully bought some of each (with crédito not débito por favor)and eventually met up with my hostess Arcelia of Mission Chocolate to visit Mestito Chocolate so I could checkout the 30 kg beast of a roaster I would be testing the following day and using to teach on further in the week. I met a number of people, many of which I would get to know rather well over the next two weeks. I’m not actually going to list them out as I know I’ll leave some out and I don’t wish to slight anyone. There were SO many people and names and new words and new experiences and.....minor overload. Suffice to say they were welcoming to a fault. Dinner and drinks (my first caipirinha (Brazil's national cocktail – limes (they have something like dozen varieties and love them all) – sugar (3-4 options) and water) with cachaça (their national distillate from fresh sugar cane) ensued. Pedro Caetano, Luisa Abram, Juliana & Tuta Aquino and yours truly. All but Tuta would be taking my roasting seminar and I visited all their farms and factories. Back to Mestito Chocolate to learn how to control the roaster I would be using the following day. A few hours and three pretty horrible roasts later (but steadily improving) I had control down and was ready for the seminar. I asked Rogerio (shown above) if he could make the roasts into chocolate for educational purposes. More on this later. We visited Bianini Chocolate’s factory where I got to taste some of their chocolate, saw what they use for a cracker (it is a coffee pulper) and talk more at length with Tuta, who runs the farm and Juliana, who makes the chocolate, an amazing husband and wife team if I ever saw one. We then head onto Luisa Abrahm’s factory. The majority of chocolate makers in Brazil, regardless of size use small melangers. (sorry about the blur). And then that evening I saw my first cocoa tree…in the middle of Sao Paulo! I gave my first roasting seminar. This was one of the main reasons I went to Brazil. 11 am – 7 pm. 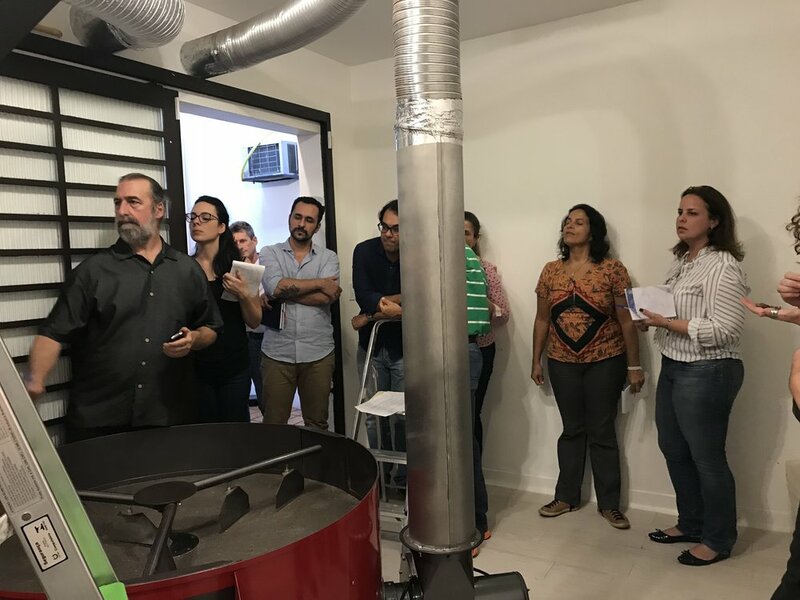 We had to set up an aroma tube from the vent so we could smell the progress of the beans during the roasting portion of the seminar. After the seminar I got to spend a quiet evening with Zelia of Chocoweb talking chocolate, bean to bar and just the state of the world. This kicked off Bean to Bar week. Interestingly (to me) they don’t translate to Portuguese. It was an amazing time being recognized and having people come up for photos and to say thank you for all I've put out. I can't describe how humbling it was. This was as my hostess affectionately called it, Gringo day. Greg of Dandelion spoke of sourcing, Sunita of Chocolate Garage gave a tasting, Pearl Wong presented some chocolate from a conching experiment she did and sadly I missed what Seneca Klassen talked about. I gave a talk about roasting and present some truly awful chocolate. This was the chocolate that was made from the test roasting I did where I created a huge number of roast defects. Although none of the chocolates were good, people could pretty clearly taste how the chocolates improved as the roast profiles because more controlled and what they should look like. I participated with the other gringos on a panel answering questions from Arcelia and the audience. This was my 2nd full length roasting seminar....the 8 hour seminar that turned into a 10.5 hour seminar. Lots of lecture, amazing questions and roasting of course. This was basically a free day. The festival was mostly in selling mode here but I couldn't help stopping in before we (the Americans) headed out for coffee, seafood, Batman alley and a highly recommended chocolate shop. So I’m going to go ahead and stop this for now and talk about the week of farms in Part 2.